The heart of the RSpec Explorer system is a turn-key, slit-less objective grating system. The grating is sealed in the camera, so it’s immune to dust and dirt. The RSpec Explorer spectroscope is designed for demonstrating spectral sources (such as gas tubes), and for measuring the spectra of a wide range of light sources, including LEDs, street lamps, and others. Spectral range is approximately 390 to 700 nanometers. Accuracy is generally 1% or better. Spectroscopic features as narrow as 3 nanometers can be measured. 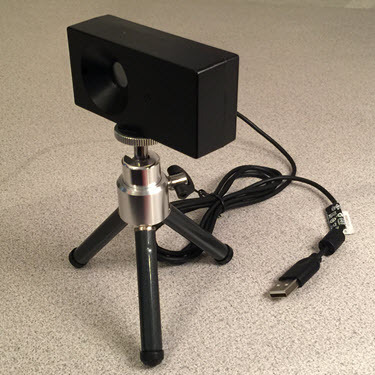 The RSpec Explorer digital USB camera is a rugged and proven instrument. It’s engineered and produced by a leading camera manufacturer and has been used in a wide range of commercial applications. These cameras are known for their reliability, compatibility, and flexibility. The camera’s default mode is fully automatic, so it auto-focuses and adjusts to a wide range of light conditions. Gas tube spectra are easily observed in a typical classroom setting. Position the camera approximately one or two meters from your gas tubes. You do not need to turn off the room lights, but a relatively dark and smooth background will give best results. The system comes with a standup matte black background and stand for this purpose. Automatic camera settings, gamma correction, and varying ambient light conditions mean that measured flux intensity can vary in different contexts. Spectroscopic absorption lines remain accurate and clearly visible regardless of the lighting. The system includes our award-winning $99 RSpec software, available on Windows and MacOS. RSpec is used on all seven continents. (Yes, that means Antarctica too!) The software is in use by high school chemistry, physics and astronomy teachers as well as professors in well-known universities and community colleges. Some locations have site licenses for student lab use. Others are using the software with professional astronomical instruments. And still others are using the system to teach spectroscopy in the classroom as well as at public outreach events. Created by an experienced team of professionals, the software reflects more than 100 years of combine d experience of our engineering team. You’ll find that the program is stable, well-designed, and easy-to-use. You’ll be capturing spectra 5 minutes after you install the software. The software comes with a collection of professionally-produced video tutorials that walk you through operation of the program. When you purchase the spectometer for $395, you get a free copy of the $99 software. The software runs on all versions of Windows starting with Windows XP, 32 or 64 bit machines. As of May 2017, the software is also available on Mac OS. When you purchase our spectrometer you get both the Mac and Windows software from the download link we provide. This LED Tower is the one you saw in our YouTube product video (link). It’s a perfect add-on to the RSpec Explorer system. Turn on one LED at a time, or all of the lights at once. The LED Tower is wonderful for demonstrating the properties of light and challenging your students to explain what they’re seeing. Comes with small 110-220 power supply with 2-prong North American wall plug. Just turn it on and point your RSpec Explorer spectrometer at it and you’re ready for an exciting classroom activity with your students. Support is available free of charge via email or phone. Coming soon: our on-line forum will allow you to connect with other educators and share your experiences using RSpec Explorer.